About: Paradise By Way Of Kensal Green is a pub that serves a variety of beers, wines and spirits as well as a selection of Thai, Oriental and Chinese dishes for lunch and dinner. They also operate a BYO (Bring Your Own Bottle) policy and can cater for private parties of up to 120 people upon request. Outside seating is provided in the garden. Not content with being a bar, club and resturaunt Paradise by Way of Kensal Green took one more step towards monopolizing the nightlife whims of west Londoners by adding its very own private karaoke room. This gastro pub by day turns the music up in the evenings, leading to much inebriated dancing and flirting. Paradise has become a favourite Friday night haunt among West Londoners. "Gastro-pub thinks it’s a club"
A bit like the Westbury in Kilburn, the helpfully named Paradise by Way of Kensal Green is essentially a gastro-pub that likes to think it’s a trendy club. On occasion Paradise plays host to book launches, birthday celebrations and fancy dress parties hosted by pop starlets and celebs which has no doubt raised its kudos; the rest of the time there is stand-up comedy, karaoke, or DJs playing run-of-the-mill pop and dance tunes to a rapidly inebriating public. Even the décor is strikingly similar to that of its Kilburn neighbour; think old-fashioned aspirations with perhaps a touch more lavishness in the form of high ceilings, dripping chandeliers, ornate curtains, paintings and candlelight. 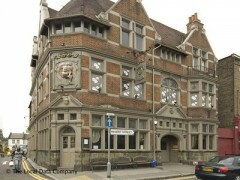 While the ground floor offers dining and casual drinking, the upstairs contains the ‘Music Room’, where the dancing takes place on Fridays and Saturdays. The part Victorian part French chateau-inspired building is completed by a roof terrace and a separate covered smoking area; there’s certainly no shortage of places to hide. Its aesthetically pleasing opulence makes it an appealing place to eat too, particularly seeing as the menu contains upmarket fare like cote de boef, cod Provençal and oysters, and Chef Tim Payne boasts credentials such as working with Marco Pierre White and a stint at Quo Vadis. Since opening in 2007 Paradise has become a popular haunt for the locals, especially among the new W11 set who are seeking a bit of Notting Hill glamour but have become priced out of the area, leaving them to venture further afield. I love this place - and not just because its near where I live. I love the way its set out and I love the atmosphere. People of all ages too, though it does get really crowded. have been there a few times and will definitely go again. This pub is widely underrated as an all around great place. It works on the weekends, plenty of good looking people and fun music. It works during the week, I've taken family from out of town there and they loved it. Good for food, and drinks are reasonable. I heard they have guest celebrity dj's there alot and I even think I may have seen some of London's glitterati one time I was there (but too many pints to realize it). If you havn't been, you should really check it out. I went here for a girls night out a few weeks ago and really enjoyed it. We had a top-quality meal downstairs first followed by great dancing upstairs after. Felt like a grown-up approach to clubbing and had a better crowd to match. Interior was unusual (in a positive way) and added atmosphere to the evening. Would definitely recommend. Paradise is by no way of Kensal rise! We went there for a quiet evening were sorely disappointed by our experience. We ordered and paid amongst other plates the £10 charcuterie plate from the bar menu which we were told was not available once all the other plates started arriving and they simply replaced it with another plate of lesser value without even offering a refund or apology!!! We were constantly hassled by the clientele for our stools and as we were leaving we witnessed the bouncer being accused of racism by a rather angry young woman. Do not go there for a peaceful evening, this pub looks gentrified but trust me the experince is far from it!